This exhibition highlighted National Geographic Explorer-in-Residence Dr. Paul Sereno’s groundbreaking discovery of a giant, 110-million-year-old crocodilian, Sarcosuchus imperato. The fossilized skull and partial skeleton were discovered in the harsh dessert of the Niger. SuperCroc is over 40 feet long and weighed nearly 10 tons, making this a huge find both in terms of size and significance. 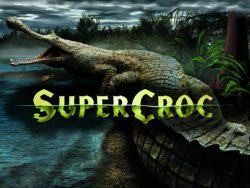 National Geographic Channel presented SuperCroc in partnership with the Houston Museum of Natural Science.